A Cal Poly fraternity’s decision to remove a member accused of multiple sexual assaults has played a role in its dissolve, according to its president and several members. 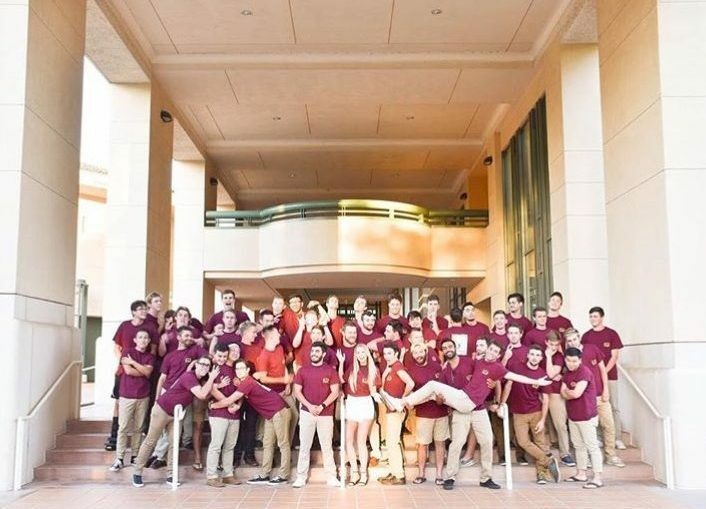 The Kappa Delta chapter of Delta Tau Delta (DTD) fraternity officially dissolved Jan. 19 following a membership review conducted by the fraternity’s national organization that removed all but 15 men from the fraternity, according to former DTD President Nick Miller. DTD announced the dissolve in a Facebook post Jan. 21. DTD was placed on full probation by its national organization and the university during Spring 2017 for violating the Fraternity and Sorority Alcohol Policy, Party Registration Policy and Hazing/Conspiracy to Haze in the Registered Organization Student Code of Conduct and Penal Code. The probation was to last until June 15, 2018. In Spring 2017, DTD removed a member of their fraternity accused of at least seven sexual assaults. According to industrial engineering junior Miller, the expelled member sent a video of an unregistered party to DTD’s national organization as retaliation against the chapter. This video resulted in full probation for DTD, according to Miller. Chief Operating Officer of DTD national fraternity Jack Kreman declined to comment about the expelled member or his involvement in DTD’s probation. Then, during Fall 2017, DTD hosted a party while on probation which extended social probation until Dec. 14, 2018. Because of the extended sanctions, DTD’s national organization conducted the individual membership review between Jan. 12-14. When the review concluded, the chapter had shrunk from 65 members to about 15, according to Miller. According to Miller, the fraternity’s remaining members then voted unanimously to dissolve. Miller said this was because of a “disrespectful” and “coercive” line of questioning during the members’ reviews. Miller also said DTD could not have realistically operated with only 15 members. Miller said he finds it ironic that DTD’s decision to expel a member of the fraternity for sexual assault allegations ultimately led the chapter to be punished by their national organization. The expelled DTD member was found not guilty of at least one incident of sexual misconduct. Three formal Title IX complaints are among at least seven brought forward to Safer. Mustang News is not aware of the outcomes of the other two Title IX investigations. Miller continued to say he feels DTD did more to punish the accused sexual assailant than Cal Poly’s Title IX Office, noting that the former member is still a student. Dean of Students Kathleen McMahon said the university is prohibited from discussing or acknowledging any Title IX cases. According to DTD’s national organization, the Kappa Delta chapter was chartered by the international fraternity Sept. 26, 2015. To date, 116 men have been initiated into Delta Tau Delta by Kappa Delta. In a statement to Mustang News, Kreman said that while DTD respects Kappa Delta’s decision to surrender their chapter, they are disappointed in the fraternity’s decision. Kreman also said DTD desires to have a presence at Cal Poly and will work with administration to discuss returning to campus. According to McMahon, the students who disbanded the chapter have forfeited their opportunity to be involved in another fraternity.